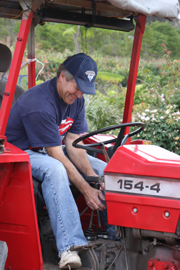 Providing high quality plants and seed for 50 years. The California Latino Water Coalition is taking up Eric's cause and moving it forward with an international forum April 7 in San Diego's Balboa Park. Click here for details. 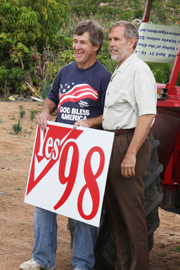 Governor's Response to Eric (6/5/08). Images from this page may be used for related news stories. If you need a hi-res version of any photo, please click here to request one. Mouseover the breaking news below to read details. Breaking news: 5/26/08 3 p.m. 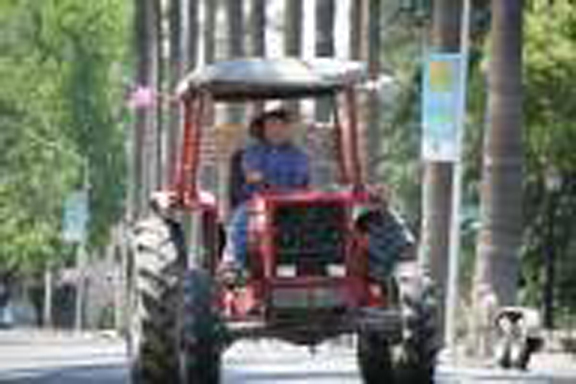 Breaking news: 5/26/08 5:41 a.m.
Eric reports that Sue Varty, president of the Olivenhain Municipal Water District, drove the tractor for nearly five miles in the Los Banos area yesterday. 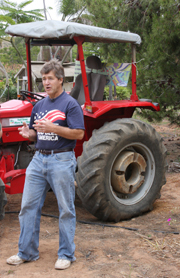 Their arrival in Sacramento was celebrated by a barbecue with local farmers. 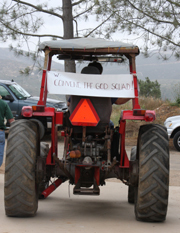 Eric heads home today and plans to be back in Elfin Forest tonight. 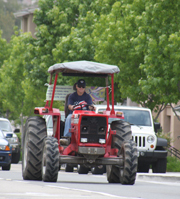 Eric arrived in Bakersfield today via his tractor, but was slowed down by an alternator that needs repair before he can continue the journey to Sacramento. "The last thing I expected on this trip was to get rained on. We even had snow in Tehachapi." said Eric. 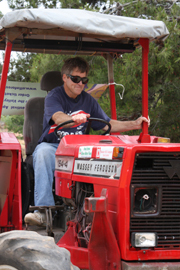 Chuck Badger, Jr., president of the San Diego County Farm Bureau said, "Most of us think Eric's a little crazy for doing this, but we certainly wish him well and are glad he's taken this on." 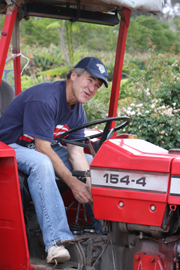 With the cost of diesel fuel skyrocketing, Richard Schuster of Schuster Oil added, "I figure if Eric's crazy enough to drive his tractor to Sacramento, the least we can do is buy the diesel for him." 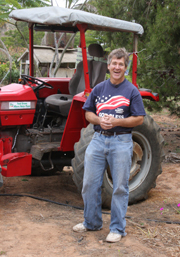 Wayne Dunlap, Libertarian Party candidate for Congress - 50th District, added, "I'm inspired by Eric - he's a modern day Paul Revere, riding to Sacramento to warn people of the impending economic problems connected with water restrictions." Made it from Fresno to Patterson in 12 hours. Again more rain on the road! It was especially bad near Mendota after passing the Spreckles sugar plant. It was 9 am and lots and lots of trucks going 60! Every time they went by I got really creamed by the water. Not much fun. from the Westside and from several different water districts. 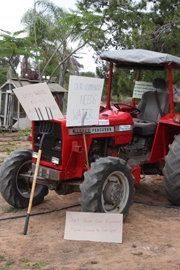 They are cut back almost 80% of what they have contracted for in water deliveries. They are hit with the water restrictions much harder then even I am. They were very supportive, replaced my battery (which had died when the alternator went, I was having to jump start the tractor every time I turned it off. With a renewed sense of purpose I took back roads up near Los Banos through Volta and made my way to Patterson. We could see dairies and a bumper crop of almonds, wheat, alfalfa, and lots of apricots (not quite ripe). Breaking news: 5/25/08 6:04 a.m. 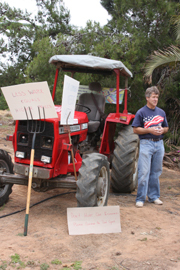 Breaking news: 5/23/08 6:10 a.m.
ELFIN FOREST, CA - Driven to frustration by a lack of action over the years by California’s leaders to create a water system that is adequate to serve farms and a growing population, farmer Eric Anderson is making plans to drive home a message. 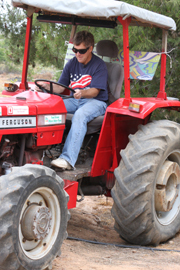 On Thursday May 22 at 11:00 a.m., Mr. Anderson will climb aboard his tractor at his family farm in Elfin Forest for a nearly 500 mile drive to the state capitol, arriving on Memorial Day for a picnic at a nearby park. “Sometimes I wonder if anyone in Sacramento is listening. 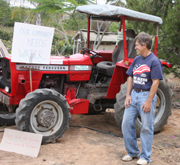 We have farmers across the state and right here in San Diego County who have had their water supplies slashed,” Anderson recently stated. 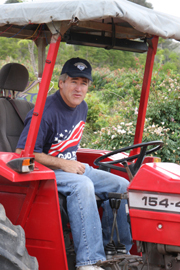 He added, “While farmers are having their livelihoods threatened all we get from Sacramento is partisan bickering.” Next year the whole Southern California economy faces catastrophe if there is no water to deliver. 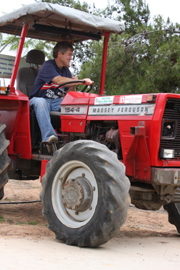 When speaking recently to farm colleagues about the long tractor ride, Anderson said he couldn’t sit by any longer. 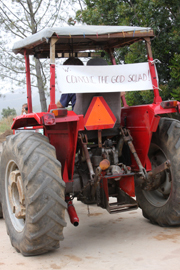 The message he wants to deliver is that it is now time for action. 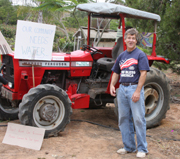 “We’ve known for decades that this day of water shortages was coming, yet nothing has been done. 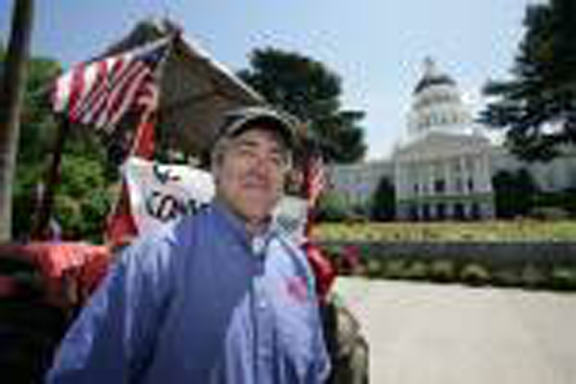 I’m driving to Sacramento and asking for action,” Anderson said. The action he plans to ask for includes more water storage to carry the state through dry years and a comprehensive fix for the Sacramento/San Joaquin Delta where the water used by 25 million Californians originates. About 750,000 acres of farmland are irrigated by Delta water as well. 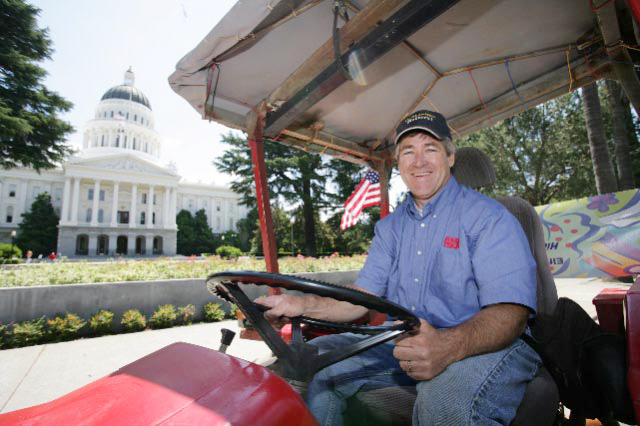 He’ll also call on Governor Arnold Schwarzenegger to consider asking President Bush to convene the Endangered Species Committee, commonly referred to as the “God Squad,” to examine the Endangered Species Act limitations on water pumping from the Delta to most of California. Photos by Evelyn Alemanni, photos in top row by Scott Monaco of Ag Alert. I have made it to Fresno! Lots of RAIN as I left So Cal. Beautiful day yesterday in the Valley. My alternator went out and had to be replaced. Lucky this area has plenty of tractor parts. 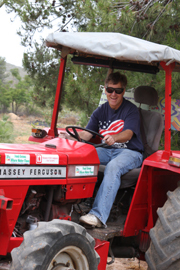 My Massey Ferguson 154-4 is from 1973 and a special edition with a Perkins engine. It was a challenge to find parts. Lots of help from the local folks on where to track it down. I will try and get to Stockton today, the rain is coming down pretty good right now (6am Sunday) who would have thought! The worst is the water my front tires kick up in my face when it is raining. 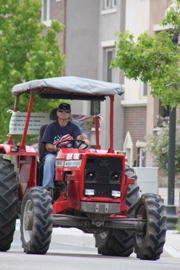 Made a stop at the Preharvest festival near Dinuba for lunch yesterday. Really nice. The back roads were pretty quite yesterday. are paying for my diesel. Who would have thought over FIVE dollars per gallon! leave a message and I will get back to you during a break. 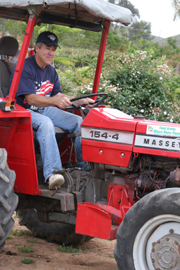 Many of you do more miles on your tractor when you plow and care for your fields. The only difference is that you don't have to dodge cars and trucks. 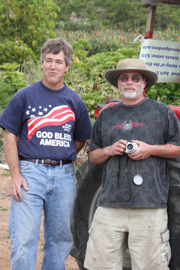 Copyright © 2006-11 by La Costa Flower Shop & Nursery, Inc. DBA Anderson's Seedco . Contents of this site may not be copied, reproduced or distributed without prior written permission. Last modified: December 22, 2011.